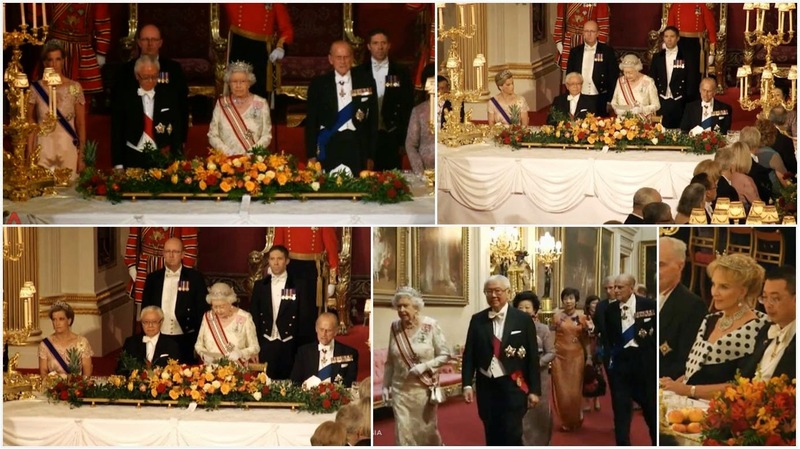 The Queen and The Duke of Edinburgh, with other members of the Royal Family present, gave a State Banquet in honor of the President of the Republic of Singapore at Buckingham Palace. There's red in her sash and that means of course my first thought is that we have another missed opportunity for the Oriental Circlet to appear. But never mind, Her Maj likes her favorites and the ubiquitous Girls tiara is reigning for the night. She paired this with another selection from her collection of bow brooches and the massive diamonds from the Coronation Necklace and Earrings. I have not yet seen a good enough photo to identify her bracelet, but hopefully will be able to update later. Her watch is one she's worn many times, but it doesn't have its own post here yet. Sitting at the banquet table, the guest of honor has The Queen on one side and another female royal on the other (at least when the guest of honor is a male). It's usually Camilla, and when she's gone, the honor travels down the line. The Princess Royal was also absent this evening, and we ended up with a special treat: Sophie! Also click here for Majesty's Facebook post. She sported her newest tiara, the Five Aquamarine Tiara from HM's collection, and I don't blame her for wearing it so often - it's my favorite of the ones she wears too. Also present were Princess Michael of Kent, in her Kent Festoon Tiara, and Princess Alexandra of Kent, wearing the pearl version of her Ogilvy Tiara. Click here for that. In the Zimbio gallery linked above, it appears the Duchess of Gloucester is wearing the Cartier Indian Tiara. Update: A couple videos are out of the banquet. The British Monarchy's video of The Queen's Speech is below; ChannelNewsAsia also offers some additional views. Screencaps have been added above. Update Again: For those sore that the lovely Duchess of Gloucester did not get a proper close up at the state banquet, enjoy this look at HRH shining in the Gloucester Honeysuckle Tiara at tonight's (10/22) Guildhall banquet for the President and Mrs. Tan.